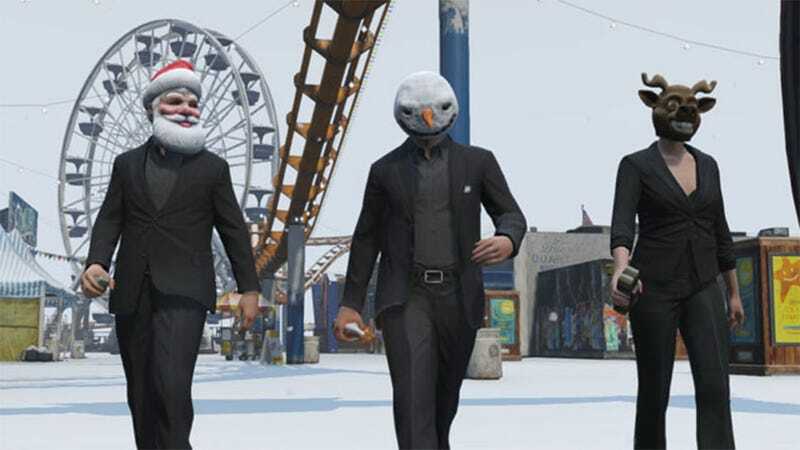 Gifts like special limited-time, holiday themed items available in GTA V's clothing shops until January 5. Buy now and then break out the snowman and Santa masks in the middle of summer to up the creep factor. Like taking pictures? Rockstar's has also rolled out a host of new Snapmatic features — filters, borders, facial animations, a depth of field effect and the Meme Creator, which allows players to add meme text to their snaps. Scary. All this, plus sales on virtual items you're spending virtual money on, which always seems so pointless but the kids seem to dig it. Whatever, I'm just in it for the hazardous road conditions. They don't have snow chains in Los Santos, so the next two days should be gloriously chaotic. Ho, ho, ho.